Anybody hear yesterday’s volatility blamed on Counterparty Tuesday? Most pointed to earnings fears for why blue chips fell 500 points before clawing back. Yet last week the Dow Jones Industrial Average zoomed 540 points on earnings, we were told. We wrote about it. Counterparty Tuesday is the day each month following expiration of the previous month’s derivatives contracts like puts, calls, swaps, forwards (usually the preceding Friday), and the start of new marketwide derivatives contracts the following Monday. When grocery stores overstock the shelves, things go on sale. When counterparties expect a volume of business that doesn’t materialize, they shed the inventory held to back contracts, which can be equities. Counterparty Tuesday is a gauge indicating whether the massive derivatives market – the Bank for International Settlements tracks over $530 trillion, ten times the global economy – is overstocked or understocked. It’s much larger than the underlying volume of Active Investment behavior in the US stock market. Let me use a sports analogy. Suppose your favorite NFL team is beating everyone (like the LA Rams are). “They are killing everybody through the air,” crow the pundits. You look at the data. The quarterback is averaging five passes per game and zero touchdowns. But on the ground, the team is carrying 40 times per game and averaging four rushing touchdowns. These statistics to my knowledge are fake and apply to no NFL team right now. The point is the data don’t support the proffered explanation. The team is winning on the ground, not through the air. In the same vein, what if market volatility in October ties back to causes having no direct link to corporate earnings? What difference does it make if the stock market is down on earnings fears or something else? Because investor-relations professionals message in support of fundamental performance, including earnings. Boards and management teams are incentivized via performance. Active stock-picking investors key off financial performance. If the market isn’t swooning over performance, that’s important to know! Returning to our football analogy, what data would help us understand what’s hurting markets? Follow the money. 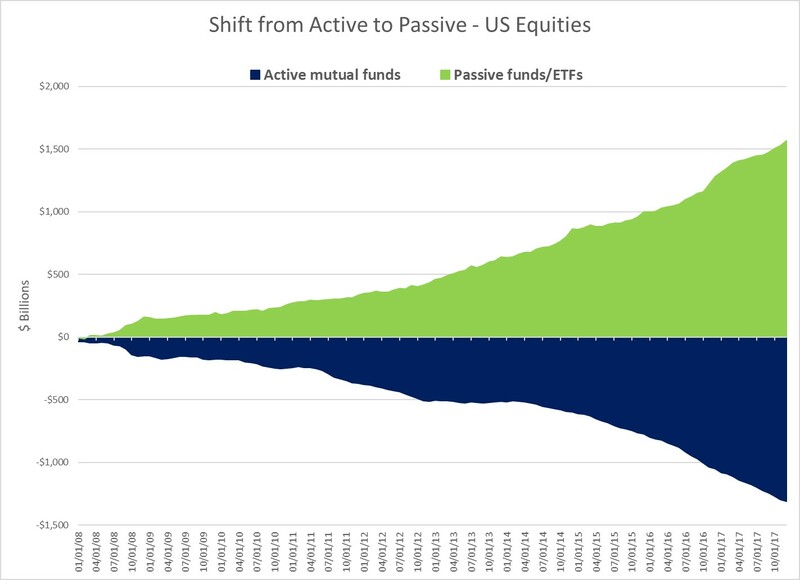 We wrote last week about the colossal shift from active to passive funds in equities the past decade. 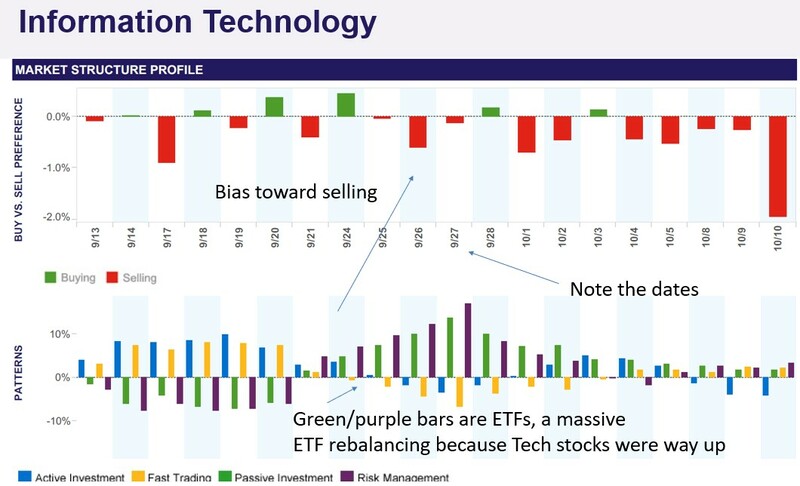 That trend has pushed Exchange-Traded Funds toward 50% of market volume. When passive money rebalanced all over the market to end September, the impact tipped equities over. Now step forward to options expirations, which occurred last week, new ones trading Monday, and Counterparty Tuesday for truing up books yesterday. Money leveraged into equities had to mark derivatives to market. Counterparties sold associated inventory. Collateral has likely devalued, so the swaps market gets hit. Counterparties were shedding collateral. The cost of insuring portfolios has likely risen because counterparties may have taken blows to their own balance sheets. As costs rise, demand falters. Because Counterparty Tuesday in October falls during quarterly reporting, it’s convenient to blame earnings. But it doesn’t match measurable statistics, including the size of the derivatives market, the size and movement of collateral for ETFs (a topic we will return to until it makes sense), or the way prices are set in stocks today. Th e good news? Counterparty Tuesday is a one-day event. Once it’s done, it’s done. And our Market Structure Sentiment index bottomed Oct 22. We won’t be surprised if the market surges – on earnings enthusiasm? – for a few days. The capital markets have yet to broadly adapt to the age of machines, derivatives and substitutes for stocks, like ETFs, where earnings may pale next to Counterparty Tuesday, which can rock the globe.